A semi-dwarf variety, the Braeburn is fairly easy to grow and produces heavily at a young age. This apple is firm to the touch with red-orange vertical stripes against a yellow-green body. Best eaten slightly cooled to bring out the sharp refreshing flavor that has a good balance of tartness and sweetness. Good cooking apple as it holds it shape, also producing a lot of liquid making it ideal for tarts. Stores well when kept chilled. Pollinates with Fugi. 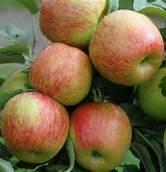 We offer Braeburn 1"+ caliper plus in a 15 gallon container. As our world is changing so are we. Gardens have always been in two categories, one for food the other for beauty. More and more these categories are becoming one. Landscaping with edible plants is becoming increasingly popular. Not only is there beauty but there is an added benefit of healthy homegrown items. Apartment living can also benefit from smaller plants from vegetables and blueberries to strawberry and everything in between can be grown in pots on patios or balconies. The fruit trees we offer are semi-dwarf.